Las Vegas: The World’s Convening City? Conventional wisdom, and in many cases wishful thinking, among many urbanists holds that America’s sunbelt cities are done. Yet in reality, as they rise from the current deep recession, their re-ascendance will shock some, but will testify to the remarkable resiliency of this emerging urban form. The epicenter of the sunbelt rebound will be Las Vegas. The desert city has taken a unique road to a world city status. Most places get there by being financial, trade or manufacturing hubs, or can have a concentration of all three in the case of the biggest and most connected world cities. In contrast Las Vegas has achieved world city status via one key sector: entertainment. Just about no one saw Las Vegas coming as a world city. Even in the late 20th century few would predict that the region could ever get to 1 million residents, let alone reach two million. In 1970 Jerome Pickard, a demographer working at the ULI—the Urban Land Institute in Washington, DC, projected U.S. metropolitan area populations to the year 2000. These estimates were nearly perfect, but for one major exception—he missed Las Vegas. Las Vegas at the time seemed like, to make a bad pun, a one trick town. Its main industry, gambling (or “gaming” in local parlance), was pretty much unique to Nevada. Sure, the city already had landmark hotels and the famous “Strip” was by then iconic enough to influence American architectural theory, but the idea of an overgrown honky-tonk town as a true world city seemed a stretch. A generation later, what changed? To start, gambling began to spread throughout the U.S. and indeed the world. First, Atlantic City, NJ, allowed gaming in the late 1970s and soon the floodgates opened. Soon people could gamble on riverboats in the Mississippi and off the Gulf Coast. Then a Supreme Court ruling allowed Native Americans to build and operate casinos—and they did just about everywhere. Every time gaming expanded, analysts predicted the demise of Las Vegas. Yet history has shown that the widespread diffusion of gambling only induced a bigger appetite. In this socio-cultural-legal-lifestyle transition, Las Vegas became the epicenter of gaming. Many people who gambled in a nearby Indian reservation were really just warming up for Las Vegas. The gaming industry in Las Vegas also matured in two key ways, offering a host of complimentary activities to go along with gambling. The first was the Las Vegas tie into Hollywood and live entertainment. By the 1980s, Las Vegas became one of the world’s largest venues for entertainment, surpassing even Broadway in New York. The city then began to add function after function related to tourism—food, shopping, and perhaps most importantly of all: conventions. Las Vegas’s rise also was directly tied to infrastructure. Completed in the 1930s, Hoover dam provided Las Vegas with ample power and water. The other major improvement was a new highway to Los Angeles, which led to Vegas’s discovery by Hollywood figures. At the same time, a series of complimentary economic drivers transformed the city over several decades. The casino and entertainment complex constructed in Las Vegas by 1970 soon engendered a proliferation of airline connections and convention business. The city had enough business to warrant non-stop links to just about every other major city in the U.S. The scale of tourism worked to keep landing fees among the lowest of any major American city. In 2008, McCarran Airport ranked 15th in the world for passenger traffic, with 44,074,707 passengers passing through the terminal, and 6th in airplane “movements,” which includes take offs and landings. The other advantage Las Vegas possesses is lots of hotel rooms. In fact, nine of the top ten largest hotels in the world can be found on the Las Vegas Strip (which technically lies outside the city proper in unincorporated Clark County, NV). The presence of so many hotel rooms facilitated the emergence of the nation’s largest convention business. The city is also a leading center of producer services specific to gaming. Las Vegas is to gaming what Houston is to energy, the command and control center in a booming global business. Like Houston, whose initial energy business growth came from nearby oil wells, Las Vegas’s initial advantage derived from being home to the first large-scale gaming industry. Many overlook the fact that the U.S. is a service exporting powerhouse, with almost a half trillion dollars in overseas sales last year. In fact the U.S. captures over 14 percent of total world service trade, which performed much better in the current recession than did goods trade. Las Vegas is now grabbing a bigger share of these exports. As gaming spread, Las Vegas firms that specialize in building and managing mega-resort and entertainment complexes often built, designed, or consulted on new gambling centers from Atlantic City in New Jersey to Macau in China (which recently passed Las Vegas in total gambling revenue). In the current recession, as gaming revenue plummeted in Las Vegas, properties in much of the rest of the world kept performing, especially China. This geographic diversification strengthened the bottom line for such Las Vegas-based companies as MGM-Mirage and Wynn and sustained the local firms that export gaming services. To consolidate its gaming and entertainment gains, Southern Nevada must still diversify its industrial mix to reach a multi-dimensional world city status as say Los Angeles. Fortunately Las Vegas has the capacity to further leverage its core industry. At the same time some other key sectors look promising, especially data storage and transmission, and alternative energy technology such as solar and geothermal. Finally, Las Vegas is working to improve its transportation links to nearby Southern California and the Sun Corridor complex of Phoenix and Tucson. These regions are increasingly integrated with one another. Las Vegas’s inclusion in the larger Southwestern U.S megaregion should further connect it to the global economy and lift its status as a world city in full. Ultimately, the Las Vegas case for world city status lies in its role as the globe’s leading convening space. There are more face-to-face exchanges in Las Vegas during a major convention than key financial exchanges in New York or London. Las Vegas, on any given week, may comprise the world’s most expert cluster in a particular industry. The convening role that Las Vegas plays in the world economy comprises perhaps the biggest opportunity for additional diversification, especially given the way business is evolving in sectors such as business services. These gatherings provide a means of overcoming coordination and incentive problems in uncertain environments. It becomes an environment to create a critical “buzz” around a company, product or industry. Most Las Vegas conventions are really about deal making. Conventions also are used for industry education, vendor networking, competitor insights, networking with prospects, hosting an exhibit, and seeing customers. Another dimension to building trust in Las Vegas lies in the fact that it is very much an adult place. It is a wide open, non-moralizing, libertarian place where grownups get to have fun. Las Vegas is a place where you can, and maybe even should, mix business with pleasure. So far Las Vegas has not leveraged its role as convening place to create something on par with the New York Stock Exchange or the Chicago Board of Trade. However, the convention business can be used as the basis of what may become a permanent trade show. A harbinger of this future potential for Las Vegas can be seen in its new giant furniture mart, the World Market Center. This grew out of the city’s role in hosting the largest furniture/home wear convention every year. 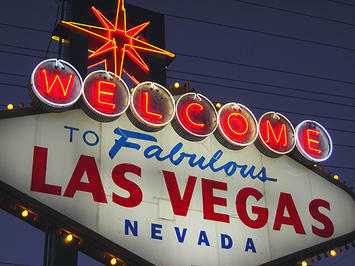 Las Vegas has developed a year round trade show capacity in furnishing with big annual events. This city is now poised to be a leading design center. Architectural and industrial design firms will follow. In this way, Las Vegas could emerge as the Milan of the U.S., where design leads to industrial spin offs. Las Vegas can expand this model to host permanent trade shows in a multiple fields from home entertainment and biotechnology to alternative energy. Rather than become a new ghost town, as some urbanists imagine, the city in fact has a bright future, one that will continue to befuddle its many critics while enriching the opportunities of its citizens. Robert E. Lang, Ph.D. is one of America’s most respect urban analysts. He is director of both Brooking Mountain West and the Lincy Institute and is a professor of Sociology at the University of Nevada, Las Vegas.